This delicious and easy Baked Heirloom Tomatoes Caprese Recipe puts a yummy new twist on the traditional Italian recipe. I breaded and then baked the heirloom tomatoes, and then arranged them with fresh mozzarella slices and basil leaves from my garden. Topped it off with a generous drizzle of balsamic glaze, and voila! 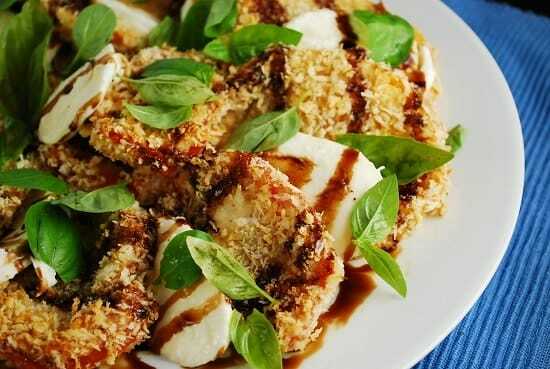 This Caprese salad makes a perfect side dish or appetizer recipe and is quite filling. Make a platter for everyone to share before dinner, or as a late night snack. Something about the tomatoes being breaded and baked that makes this recipe feel really bad, in a GOOD way! Each satisfying serving is just 6 Point, making a great Weight Watchers recipe idea for those who love Caprese salads, but want to make it a little more hearty. I will definitely be making this Baked Heirloom Tomatoes Caprese on a regular basis. Enjoy! Breading and baking fresh heirloom tomatoes and serving them Caprese style puts a new twist on a classic Italian recipe. Enjoy this delicious Baked Heirloom Tomatoes Caprese for just 6 Points per serving. Slice each tomato into 1/4″ slices, making a total of about 12 slices of tomato. Gently dab tomato slices with a dry paper towel to remove excess moisture, and then sprinkle each side of the slices with some salt. Get 3 large plates or bowls out for dredging. In the first one, place the flour, the second the egg substitute and the third the panko. Mix Italian seasoning, garlic powder, salt, and pepper into the panko. To dredge the tomatoes, take each slice and dredge in the flour, then the egg substitute, and finally the Panko breadcrumbs. Spray a large baking sheet with non-fat cooking spray, and lay the breaded tomato slices out evenly on the baking sheet. Mist lightly with an olive oil mister. Bake tomatoes until they become golden brown and crispy, about 12-15 minutes. Remove from oven and let cool four about 3-5 minutes. Assemble salad by alternating a slice of tomato with a slice of mozzarella cheese. Continue until all slices are used, and then drizzle with balsamic glaze and top with fresh basil leaves. Very nice, but what is the balsamic glaze?